This Lower Zambezi lodge in Zambia strikes a perfect balance between game viewing activities, river adventures and superb home comforts whilst on an African safari. With unrivalled views of the mighty Zambezi River, this Zambia game lodge sits in elegant splendour right on the water. Exciting wildlife encounters, fine dining and a tranquil Spa will transport guests to a peaceful state of mind and body. Every angle and curve of this Lower Zambezi lodge in Zambia is designed to afford wonderful views and the feeling of being in a gracious home. 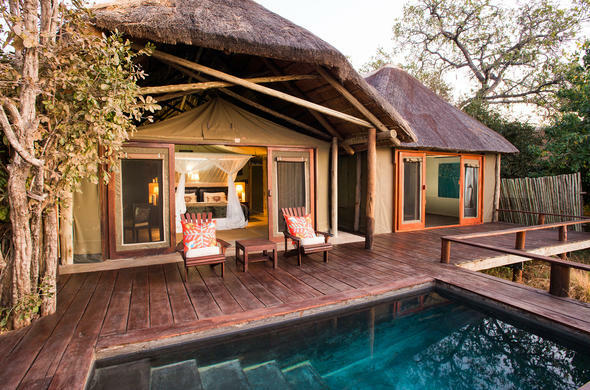 The tented suites have thatched roofs and beautiful interiors. All guest areas follow the fabulous broad wooden decks built over the water. Guests can see across one of the widest expanses of the Zambezi River and hear the swift moving water flowing beneath. The decks overlook a reed bed alive with birds, fish and water loving animals like Hippo, Buffalo and of course Elephant. On the deck, the Sausage Tree bar is constructed around an ancient tree and is the perfect place for ice cold drinks and cocktails at sunset, guests can also cool off in the lodge pool. This Zambia game lodges interiors are stylish with huge fireplaces and ample sofas and armchairs. The Royal Zambezi Lodge offers gourmet cuisine with innovative settings and arrangements to surprise and delight guests. From banquets in the Lower Zambezi National Park, complete with white table cloths and tableware, to intimate candlelit dinners on the jetty or on an island on the river. Relaxation is the hallmark of the beautiful bush Spa at the Royal Zambezi Lodge. Guests will find an extensive menu of body and beauty treatments and tranquil spaces. Varied game activities include day and night game drives, guided safari walks and canoeing, fully kitted fishing adventures and sunset cruises.